I’m really not much of a gardener. I’d love to be that girl with a green thumb who spends hours tending her garden and then cooking the fruits of her labor. The last time I had a garden I was eight years old and wore a red checkered bonnet and a homemade dress that perfectly matched my Kirsten doll. With the help of my mom, I planted a small and tidy vegetable garden in the backyard of our Florida home. That garden was my pride and joy. For the first two weeks. But then I uprooted all the radishes one month after planting them because I was just too impatient to wait for them to grow. I would uproot then re-plant the potatoes, checking daily to see if they had grown in size (they never did). I forced miniature carrots down my three year old brother’s throat while I pulled him around the neighborhood in a little red wagon. Finally, I lost interest completely and moved on to the kitchen. The next time I planted something I was twenty six and after eighteen years, thought it was time to try again. Minus the bonnet. And the red wagon. 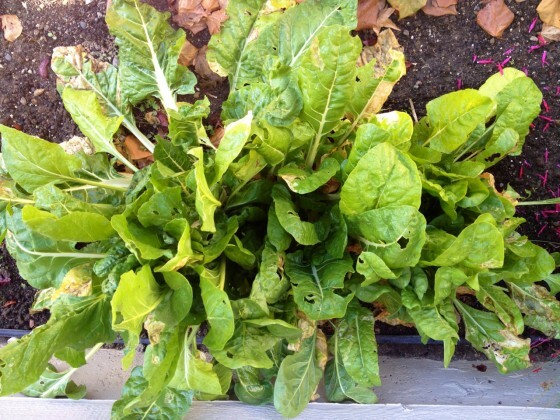 So, I scattered these swiss chard seeds last June and said a prayer. And to my disbelief, they actually grew! And grew. And grew. And grew. But the problem this time wasn’t that I was impatient or overzealous. This time, I just completely forgot about my “garden” altogether. Only when my little garden started completely taking over Adam’s front yard (oops again) did I decide to harvest my crops and actually do something constructive with them. Like, make a soup. 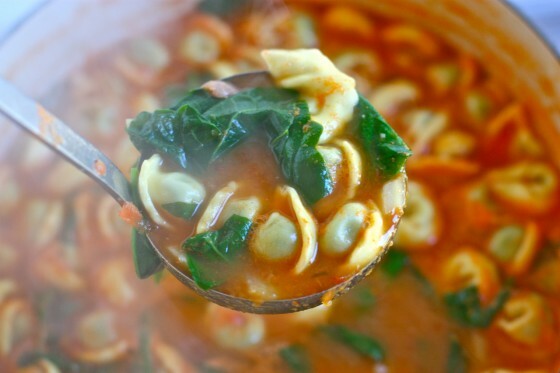 This soup has a light flavorful tomato base and is full of bursting spinach tortellini, MY swiss chard and beans! I actually won a package of beautiful Rancho Gordo heirloom dried beans at the Foodbuzz festival last weekend and couldn’t wait to cook ’em up. They went perfectly in this soup! I can’t believe this is my first time making tortellini soup. The little tortellini reminded me of cheesy dumplings and this was such an easy and quick way to make a meal out of them! 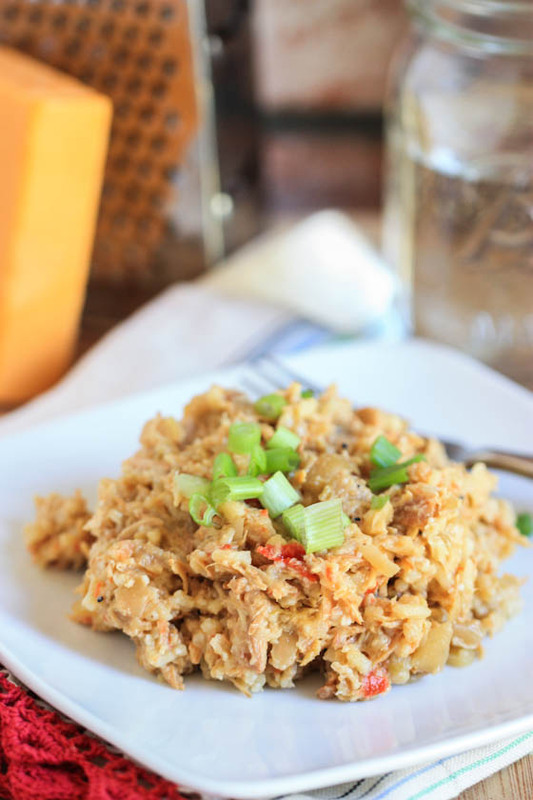 So cheesy and comforting and the perfect lunch on a chilly Monday. By the way, I’m still eating lunch at 10:30 and dinner at 4:30 over here. I can’t quite get used to the time change. Heat the olive oil over medium heat in a heavy pot. Add the garlic and chopped fennel and saute for three-five minutes, until the fennel just begins to soften. Quickly pulse the tomatoes in a blender or food processor to just barely puree (you still want some chunks). Add the chunky pureed tomatoes to the pot along with the stock, salt and pepper. Bring the soup to a boil before adding the tortellini and beans. Reduce heat to simmer and cook for about seven minutes until tortellini are puffy and cooked through. 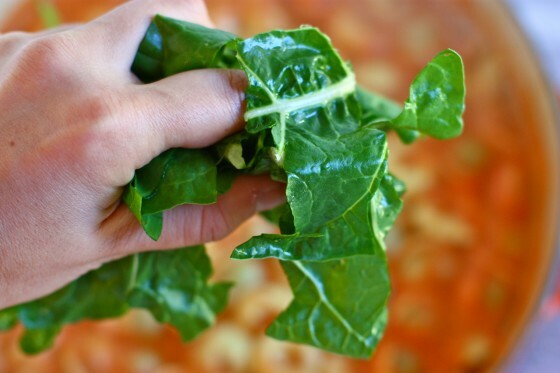 Add the swiss chard or spinach to the pot and stir so that the greens wilt. Serve soup with lots of freshly grated Parmesan cheese and additional salt, pepper or red pepper flakes to taste. Oh Jenna! I am so glad you also eat meals about 3 hours before the rest of the world! I do feel somewhat justified, because I do wake up at 5.45 am every day, but then – when I have dinner at 6 in the afternoon I curse myself thinking how STARVING I am going to be on those days when I actually have to wait for my husband or (heaven forbid) go out for a later dinner with a friend! This looks great – Im not really a pasta person, because I find it somewhat flavourless – but floating in soup!? That I could go for! I kinda wish it was cold over here so I could make this :)! Ah! It is the perfect comfort food! 🙂 thanks for the recipe! I swear I have a “black thumb.” Basil plants, rosemary and lavender bushes have all died an untimely death in our little apartment. I’ve tried watering them everyday, not watering them so much, giving them lots of sun light. No. As if they knew I took them away from their friends at the nursery, they threw a temper tantrum, throwing their leaves everywhere, and then, like an overdramatic Shakespearean character, committed plant-suicide. Long story short, plants and I don’t get along. Farmers market where someone else grew the plants with love? Sure. Seriously jealous of your chard garden lady, and the soup looks absolutely hearty and divine. Thanks for sharing! The soup looks amazing! I have always dreamed of planting a garden and then eating from it all summer/fall, and then canning what I couldn’t eat…but that hasn’t happened as of yet. There is always next year! hehe. Have a great week and thanks for the soup recipe…looks delicious! That soup looks and sounds so good! The pics are incredible. 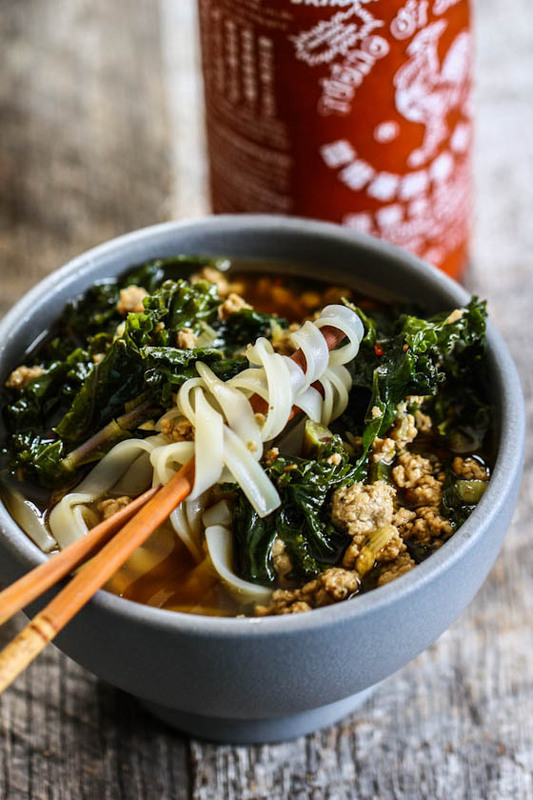 I love how you managed to keep the spinach leaves so green and vibrant in the ladle shot. Impressive! this looks cozy. I love that you planted swiss chard. it looks fab. love the story about the garden! This soup looks delicious, one of those perfect winter soups! Thanks for sharing! I wish I had these ingredients on hand right now since it’s rainy out right now. Can’t wait to try it! Mmm this sounds so fresh and yummy! This looks like the perfect winter soup!! I really like the simplicity of this soup. I’m planning on making a tomato stew later today! It’s a relief that your not a green thumb too actually! Some cooks and bloggers seem so “perfect” with their gardens, recipes, etc. and perfection is tiresome. Would this work in a crock-pot with a grain instead of tortellini? This soup sounds delicious! I’m going to try it! That’s so awesome that you grew your own chard! I’m not much of a gardener either, but this gives me hope that maybe I can grow something without killing it too. I’d love to try a few crops next summer! Ohhhh, yum! This looks so good, especially the little tortellinis. This reminds me of a soup I made in my slow cooker recently. The ingredients were similar, but I swapped out the chard for kale and added some fresh sage and basil I happened to have on hand. I’m intrigued by the addition of fennel. I adore fennel, but always forget about it for some reason! I’ll have to try this recipe soon. Thanks friend! what ever happened to the book you were writing? It’s coming out in Sept of 2012! I’ve got zero green thumb…so I completely relate to your “oops” forgot about the garden thing! Maybe there’s still hope for me too! Those beans look fantastic! 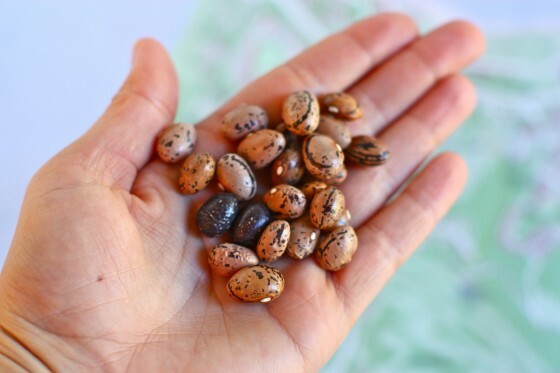 I’m planning on making Heidi Swanson’s “A Good Soup for the Sick” tonight and those would be perfect… I have bean envy. I think any recipe with the name ‘heirloom’ sounds fantastic. I’m putting this on my soup list….at this rate I’ll be making soup every night for dinner. And keep up on the gardening….even those without ‘green’ thumbs can have very productive gardens. I always suggest doing raised bed gardening in containers or larger beds built out of cedar. So much easy to manage and keeps you in the gardening groove throughout the season. I HAD KIRSTEN TOO!!! My sisters had Molly and Samantha and we would play EPIC games. i made a similar soup like this for my going away party and it was a huge hit! this looks great! Swiss chard always reminds me of our garden growing up. I can distinctly remember walking into the kitchen in the late summer and my mom sauteing the swiss chard on the stove that we grew in the garden. Tortellini soup is always a good option. It’s my go-to actually instead of chicken noodle when I’m sick. This is such a pretty soup! I love pretty food! Great looking soup! Tortellini are one of my favorite things to put in soup! YUM! This looks and sounds SO delicious! Great combination. i have killed every living plant that enters my life. i swear, i put a vase of fresh flowers on my table and they die. just like that! regardless, i’ll leave the harvesting to someone else and try this soup out asap. i love me some tortellini! I have never had tortellini and beans together. It sounds intoxicating. Also? I really think you should get a bonnet. That looks amazing! Looks boy friendly too. Yum. Perfect fall soup recipe. Gardening and cooking can be a fabulous combination…Until you end up with 30 pounds of tomatoes per day and have to figure out what to do with them all when you what you really want for dinner is chocolate cake. Yes to this! I am just going to say, that your pictures sealed the deal for me. This is one to remember for the cool weather coming soon. funny gardening story! I don’t have a green thumb AT ALL! it’s quite pathetic! I love tortellini soup! so comforting especially in this freezing weather lately! Your soup looks delicious, a recipe I want to try. I don’t have much a green thumb either. I’m actually housing potted-house plants that were my mother’s, but she recently moved back to Canada and Canadian laws prohibit U.S. soil from crossing the border. So far so good, they’re still alive!!!! We live in a high rise and I have been debating an “urban garden” since we moved in. I probably need to stick to herbs for now but that swiss chard must feel like an accomplishment! My husband is obsessed with soup so this is going into recipe circulation! I just want to curl up with a bowl of this and my favorite throw blanket. This would have been perfect for the rainy day we had last weekend. That looks SO amazing. 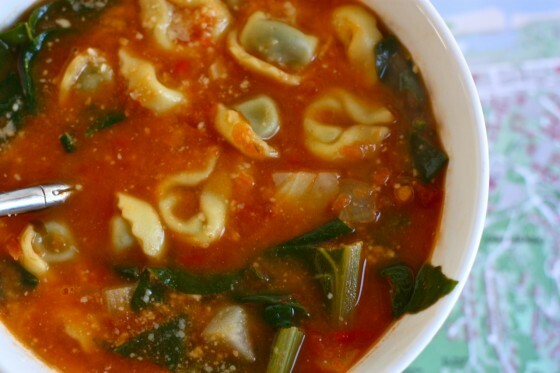 I love the idea of using tortellini in the soup! Made this tonight for supper. Like all your recipes it was great! 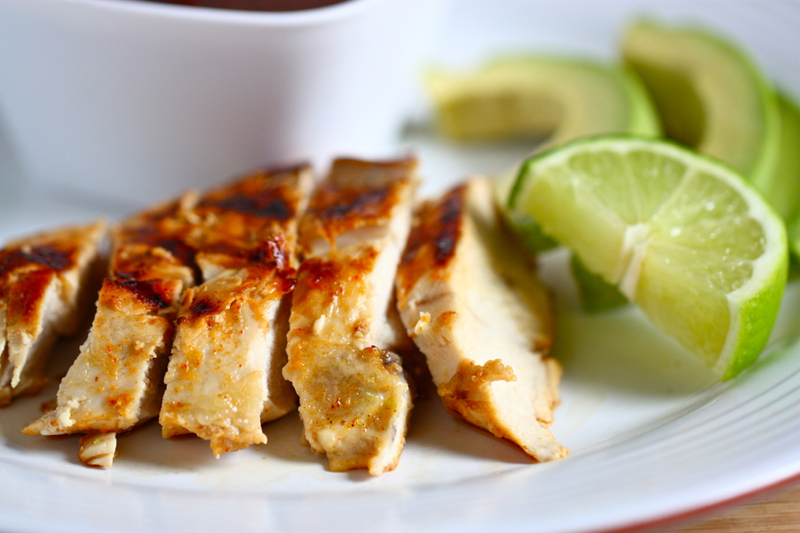 It was quick, delicious and healthy! Thanks again!! So impress about the garden! The soup looks delicious and really healthy! I made this soup tonight and the flavor was delicious, but I found it to be a little too thin with not enough filler. What size package of tortellini did you use? Also, I had never used a fennel bulb before and I wasn’t sure if I was supposed to use the whole thing? Bulb and sprigs? I’m looking forward to trying this wonderful soup! I am however in the same boat as a few others, not having used fennel before I’m not sure what part of the fennel (and how much of it) I should be using. Can I get some advice on this? Tortellini and (heirloom) bean soup | justonemorebiteplease! My brother and I just made this! We loved it!!! Thanks!